Every year, I’ve found that dressing my dog up for Halloween is infinitely more entertaining than finding a costume for myself. Dogs look adorable in pretty much everything—except maybe those terrifying spider costumes that are way too realistic. Since our favorite spooky holiday is only a few weeks away, we’ve rounded up some of the cutest Halloween costumes for your pup and they’re all available on Amazon. You’re welcome. *Full disclosure: We may receive some portion of the sales made on this list. We’re using the money to stock up on more costumes for our dogs. 21. 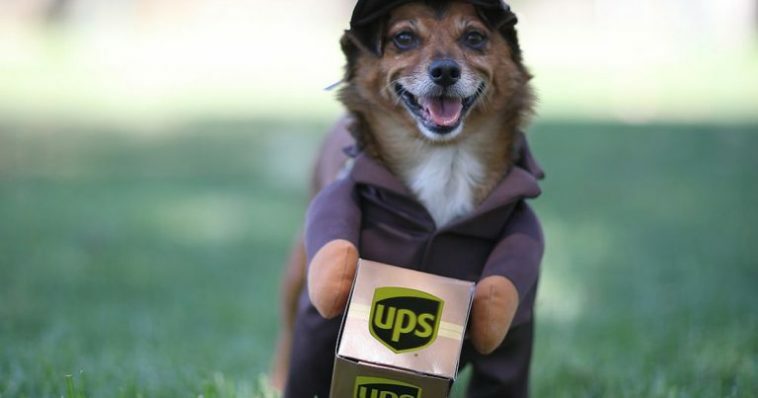 An adorable UPS worker. 20. The cutest little Ewok. 19. This teeny Beetlejuice complete with a wig. 17. This extremely handsome lion. 16. A Wonder Dog ready to fight crime. 15. This Bat Dog with felt wings. 14. And his sidekick Robin. 13. This 50s girl getup. 12. A unicorn cape complete with rainbow fur. 11. This Pizza dog that is so cute you’ll want a nibble. 10. A Minion pup that’s too cute for words. 9. This puppy spiced latte. 8. A sweet little banana boy. 7. This oh so terrifying stegosaurus dog. 6. An official Star Trek Spock dog. 5. A Mystery Machine full of meddling kids. 4. This Spider Dog who’s ready for action. 3. A very scary blue monster. 1. A snuggly teddy bear.